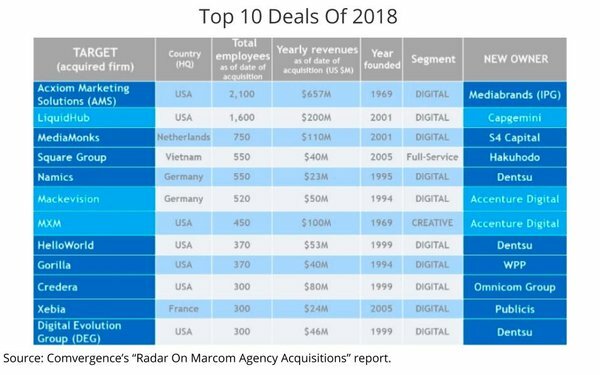 Interpublic, whose acquisition of Acxiom was the biggest deal of the year, led Madison Avenue holding companies in terms of 2018 M&A deal value, according to an annual analysis by Comvergence. In terms of overall deal activity, Dentsu was most active with 19 deals adding 2,337 employees, followed by WPP's 12 deals, adding 1,528 employees. The dark horse to watch last year was former WPP founder and chief Sir Martin Sorrell, whose fledgling S4 Capital acquired two shops in 2018: MediaMonks in July and MightyHive in December. "In the last two years now, there has been a slowdown in acquisitions," Comvergence notes in its report, adding that there were 87 in 2017, which was down from 116 in 2016. 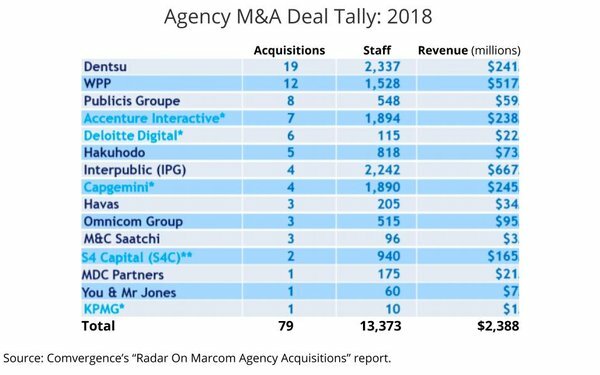 "This represents 46% less acquisitions overall (2018 vs. 2016)," the report concludes, adding, "The two most acquisitive holding companies — Dentsu and WPP — made respectively -51% and -60% less deals when comparing 2018 to 2016."